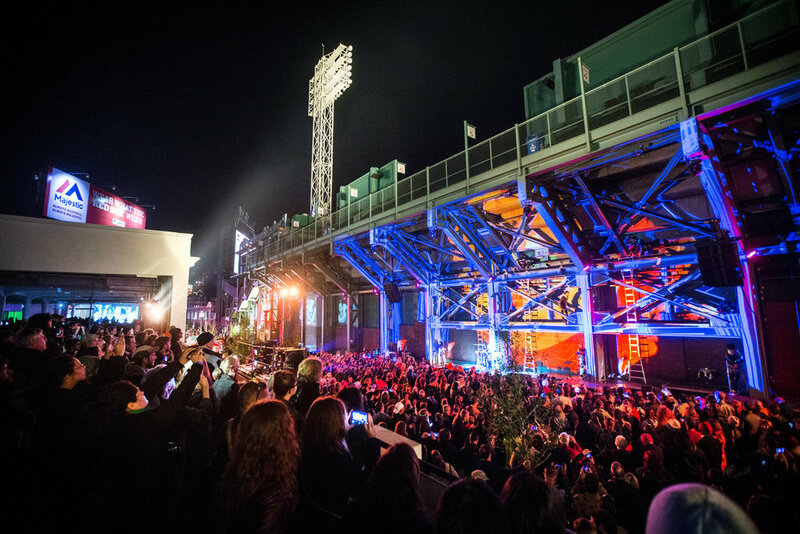 A cohort of New England­-based musicians, composers, and visual artists will transform Boston’s iconic “Green Monster” into a giant percussion instrument. This live, interactive concert will feature 15 percussionists strapped, tethered, and suspended as high as three stories while “playing” and climbing on Fenway Park’s steel girders. The six original works will exploit the unique acoustic tones that this famous structure provides. Every percussive strike will activate sound­-reactive lighting and visual projection, sonically and visually enlivening the landmark, making “Waking the Monster” a singularly Boston experience. Named a “one-woman dynamo” by The Boston Globe, Maria Finkelmeier is a Boston-based percussion performer, educator, and active arts entrepreneur. She co-founded the international percussion group, Ensemble Evolution, which has toured throughout Europe, Australia and the U.S. She has been commissioned to collaborate with, and create works for, Aaron Staebell's soloDRUMsolo project, Illuminus, ArtWeek Boston, and the Outside the Box Festival. She recently founded Kadence Arts, a non-profit devoted to incubating artistic projects, curating performances, and engaging local communities through music making. Ryan Edwards is a Boston-based inter-disciplinary artist with a background in West African drum and dance, jazz and new-music composition. He composes extensively for contemporary dance and produces multi-media performance works and installations. He holds a degree in performance from Berklee College of Music, apprenticed extensively in traditional music and instrument-building in Guinea, West Africa and works regularly with prominent American public-artist Christopher Janney. Ryan is most proud to be the father of two beautiful children, Jafiah and Maya. Sam Okerstrom-Lang or “Samo" is a Boston based new-media interdisciplinary digital artist and designer. Technology serves as a vehicle and tool in Samo’s practice in order to question the boundaries of digital communication, while in turn questions the boundary and function of the pixel. His work engages associations between technology, body, and perception by immersing the human sensory system with experiences that obscure the line between nirvana and dystopia. Born in Veracruz, Mexico, Yuriana started playing Latin-American music with her brothers at the age of 6.In 2007 her passion to study jazz brought her to Boston where she received a full scholarship to study at the Berklee College of Music. Happy to be part of Illuminus 2015! Boasting over 40 years of performing, recording and educating, Joe Galeota is currently Associate Professor of Percussion at Berklee College of Music in Boston, Hie is also the founder of JAG Drums, the leading manufacturing company of professional quality African percussion instruments since 1984. Jonathan Hess is a founding member of the Boston Percussion Group (BPeG) and can be seen performing in some of the Northeast’s fanciest rooms including; Boston’s Symphony Hall, Jordan Hall, Sanders Theater, Le Poisson Rouge (NYC), and the Peabody Essex Museum as well as recent international tours of Japan, Israel and Turkey. Percussionist Laura Jordan has collaborated with many performers and composers and has commissioned/premiered over 30 works for percussion. Laura holds music degrees from the University of North Carolina School of the Arts, the Peabody Conservatory of Music, where she studied under Robert van Sice, and is completing a Ph.D. degree at New York University. Aaron Trant has been a percussionist, composer and educator in Boston for 20 years. You can find him playing in orchestras, new music ensembles and improvisational settings throughout the city. Greg Jukes is a narrator and percussionist whose work focuses on blending music, acting, and dance in hybrid arts performances. Greg has performed across the country with his ensemble, The Fourth Wall and has been a part of large-scale performances around Boston as a founding member of Kadence Arts. Percussionist/composer who has performed in several countries and festivals. She is the director and creator of theatrical percussion show "Ideas, Not Theories" in which she writes and performs music for unconventional percussion instruments, she also teaches percussion in the Boston area. Born in Burkina Faso, Wendyam Emerson, has been exploring the percussive realm and its diversity though out the world since he was a young man. He now lives in Massachusetts, where he studied at Berklee College of Music, and is proud to be part of a project as innovative and inspiring as Illuminus. Kirsten Volness is a composer, pianist, and teacher from Providence, RI who writes electro/acoustic music for soloists and ensembles large and small. She collaborates often as composer and performer with Meridian Project, Tenderloin Opera Company, Hotel Elefant, Hub New Music, and co-directs Verdant Vibes, a new music ensemble and concert series. A passionate interdisciplinarian and collaborator, Beau Kenyon primarily draws inspiration from literature, science, philosophy, movement, and sound. Kenyon's work has been performed in various settings throughout the United States, Europe, and Mexico, with upcoming collaborative performances with the North Atlantic Dance Theater, Urbanity Dance Company, and the Boston Percussion Group. Shaun Cayabyab is a percussionist and composer from southern New Hampshire, who has had performances and compositions premiered around the Rhode Island and New England area. Shaun specializes in contemporary, electronic, and electroacoustic performance and composition, and aims to create programmatic compositions that combine acoustic and electronic aesthetics. Percussionist and composer, NATE TUCKER,was recently featured in American Repertory Theater’s (ART’s) The Tempest and Finding Neverland. As a composer Mr. Tucker’s interests are in exploring the gap between contemporary, pop and world music heard in his 2015 album "Off Grid". Isnard Dupoux (BLKBX) is a creative first and foremost, regardless of mediums, the aim is to create work that is as honest as it is engaging. In this form, the artist describes the aesthetic of (Album Title:The Sound of Gravel) as Afrofuturist pop; here themes of chronopolitics, self, current events, and magical realism coalesce into a narrative and sound that is as vulnerable as it is resilient. C. Neil Parsons is the bass trombonist with The Fourth Wall, an award-winning hybrid arts ensemble based in Massachusetts. "Redshift" is his first composition for Too Many Trombones, a group Neil founded with fellow Oberlin Conservatory alum Gabe Langfur. [BABA] is a creative sound research project of Mafu Williams and Ryan Edwards. Ingredients include: DJ, live percussion, soundscape, funk. 100% curious. Violinist and composer Shaw Pong Liu engages diverse communities with creative music and social dialogue by innovating the audience experience of live music. Recent projects include Water Graffiti for Peace, a series of outdoor Chinese water calligraphy sessions inviting public play and conversations about peace; A Bird a Day, exploring birdsong, sunrises and composition, and Sunbar, an exploration of musical interventions in public space and ideas for connecting Bostonians during long cold winters. Michael Avitabile is a flutist and arts entrepreneur seeking new ways to engage audiences with the music of our time. He is the Artistic Director of Hub New Music and loves a good cup of coffee. The Boston Globe refers to Jay Calderin as "a budding designer's best friend." Calderin founded Boston Fashion Week, and has served as the organization's Executive Director since 1995 and is an instructor and the Director of Creative Marketing at the School of Fashion Design in Boston. Eleanor Regan is a New York based producer and stage manager. She has worked at Urbanity Dance, the American Repertory Theater, the Gate Theatre, OBERON, the New York International Fringe Festival and the Kunsthalle Basel.